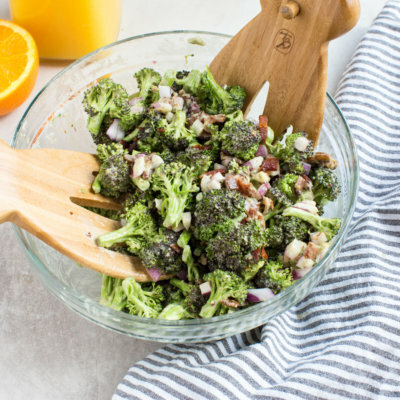 Traditional broccoli salad gets upgraded with creamy avocado and tangy citrusy dressing, you don’t want to leave out this Broccoli Citrus Salad from your next cookout. Preheat oven to 400 degrees F. Line baking sheet with parchment paper; arrange bacon evenly spaced on baking sheet. Bake for about 25 minutes until fully cooked and crispy. Remove bacon from pan and dry on paper towels to soak up any drippings. Once bacon has cooled, roughly chop; set aside. Garnish salad with bacon and pecans. Serve room temperature or slightly chilled.